Since its opening in 2005, Hong Kong’s very own Magic Kingdom has welcomed over 25 million guests. If you’re planning on heading to Hong Kong Disneyland, then picking a hotel that’s easy to get to and from is of the utmost importance. Nobody wants to be tired before they’ve even reached Main Street, and trying to shepherd sleepy kids after they’ve spent the day wearing themselves out is anything but ideal. To help you in your decision-making, we’ve rounded up 15 hotels that you can stay at to make your trip to The Happiest Place On Earth as happy as it can be! Hong Kong Disneyland is located on Lantau Island, to the east of Hong Kong. While it’s easy to get to, Lantau Island is still considered relatively undeveloped compared to Hong Kong and Kowloon, and there aren’t many hotels on the island itself. However, thanks to Hong Kong’s Mass Transit Railway (MTR), it’s easy to get to Disneyland no matter where you are. The Regal Airport Hotel is ideal if you and your family only have a day or two to spend in Hong Kong. The airport and Disneyland are situated close to each other, so why not spend the day in the Happiest Place on Earth? It’ll save you the hassle of having to navigate your way through Hong Kong and then having to worry about rushing back to the airport in time to catch your next flight. Directly connected to the passenger terminal of the airport, getting to and from the Regal Airport Hotel is simple. It’s made even better by the fact that it provides a shuttle bus service to Hong Kong Disneyland and Tung Chung, where you can ride the Ngong Ping 360 cable cars. If you’re concerned about the kids getting enough rest so close to the airport, you needn’t worry; the hotel’s windows are double-glazed and soundproof. The superb and comfortable accommodation will allow everyone to rest and recharge. However, you’ll be better off looking for food in the airport. The hotel charges for Wi-Fi, but the airport also provides that for free. Located just two stops away from Hong Kong Disneyland, the Novotel Citygate Hong Kong is great if you’re looking for a convenient location that gives you good value for money. The Novotel Citygate is just a 7-minute walk from Tung Chung Station. Tung Chung Station is located at the end of the island line, and you just have to take the train to Sunny Bay, and then change to the Disneyland Resort line. The hotel is contemporary, with a minimalist design. It offers beautiful views that overlook the mountain. However, the Wi-Fi is over-priced, so you’ll be better off buying a SIM card when you first land at the airport. The Novotel Citygate is attached directly to the Citygate Outlet Mall, where you can find some of the best deals on brands such as Nike and Burberry. It’s also located close to the Ngong Ping Tung Chung Cable Car Terminal, where you can take the cable cars up to the culturally-themed Ngong Ping Village. This is a great hotel to explore all that Lantau Island has to offer. However, travelling to downtown Hong Kong will take about an hour. If the main focus of your trip is Disneyland, then this is the best option. Otherwise, you might want to choose somewhere that’s a bit more centrally located. This is another airport hotel, which makes getting to Disneyland easy because the two are so close. The Hong Kong SkyCity Marriott Hotel is located next to the Hong Kong International Airport. It provides a free shuttle bus between the airport, Hong Kong Disneyland, and Tung Chung MTR station. Like other hotels that are on Lantau Island, it gives you the chance to experience all that Lantau Island has to offer. If you want to get to downtown Hong Kong, the hotel also offers a shuttle service there, or you can take the airport express line from inside the airport. This is an ideal location if the main goal of your stay is just to stop by Hong Kong Disneyland. Like any Marriot Hotel, you can expect impeccable service, a helpful concierge, and professional service. The beds are excellent, so you can count on getting good night’s sleep. Wi-Fi and breakfast are not included. For food, the airport and Citygate Outlets have plenty of options. Free Wi-Fi can also be found in the airport. The Four Seasons Hotel Hong Kong is centrally located. It’s just 5 minutes away from Hong Kong Station, and you can get to the Disneyland Resort Station from there (you can also walk to Central Station). One reason to choose the Four Seasons Hotel is for the spectacular views that it offers of Victoria Harbour. It’s prime location and wall-to-wall windows will give you amazing views of Hong Kong’s vibrancy no matter the hour. Its prime location makes it easy to explore. From the Central MTR Station, you can switch to any of the other lines and find your way to Hong Kong’s attractions. It also makes it easy to find services such as harbour cruises, and there is no shortage of good food around the hotel. As a Four Seasons property, you can expect a luxurious stay. The hotel boasts beautiful, well-appointed rooms and a mix of both Chinese and Western art. Free Wi-Fi is also provided for guests. The hotel has a gorgeous rooftop infinity pool, so you’ll feel as though you’re in a resort in the middle of the city. It’s a great way for the kids to cool off after a day of fun at the Magic Kingdom. If you’re looking for convenience and luxury, as well as the peace of mind that the Four Season’s reputation brings, then this is the place for you. The Holiday Inn is well-known for being a great family-friendly option, and that holds true for the Holiday Inn Golden Mile Hong Kong. It has a ‘kids eat and stay free’ concept, which gives you great value for money. Just 2 minutes away from the Tsim Sha Tsui MTR system, the hotel is easy to explore Hong Kong from. Getting to Disneyland will take about 45 minutes, although you’ll have to change train lines three times. Holiday Inn Golden Mile has a great, central location in the heart of Hong Kong. Tsim Sha Tsui is surrounded by endless shops, restaurants, and night markets. With the MTR right at your doorstep, all you need is an Octopus card and you’re good to go. While it’s not as glitzy as compared to other city hotels, the Holiday Inn Golden Mile has everything that you need – free Wi-Fi, a good breakfast to start the day, and a comfortable room with all the amenities you would expect. It’s a great combination of practicality and convenience. Getting to an MTR Station has never been easier than when you stay at the Prudential Hotel. It’s located right above Jordan MTR Station, and from there it’s an easy commute to Hong Kong Disneyland. The great thing about staying in a place like Jordan is that it’s a great combination of the things that make Hong Kong unique, such as the night markets, the shopping, and the cafes, but it’s also away enough from those places that you can enjoy peace and quiet. Just a few stops away from tourist hotspots like Tsim Sha Tsui and Mongkok, the Prudential Hotel has a prime location. It’s just a three-minute walk to the Temple Street Night Market. As a 3-star hotel, you can expect good value for money from the Prudential Hotel. The rooms are tidy and spacious. However, breakfast is not included, and the Wi-Fi is overpriced. That can be solved by buying a SIM card, and there is no shortage of good food around Jordan MTR. The Dorsett Mongkok, Hong Kong is a premium hotel that is just a short walk away from the Olympic MTR Station. It is located in the city centre, but Hong Kong’s efficient public transport makes getting to Disneyland a breeze. From Olympic MTR, you only have to change trains once to get to the Disneyland Resort MTR Station. It’s convenient, and a lot cheaper than taking a taxi. The best part about staying in the Dorsett Mongkok is that you’re staying in the heart of Hong Kong – Mongkok is where the different facets of the city mesh together. Upscale shops, outdoor food stalls, and wet markets come together, giving you a truly authentic Hong Kong experience. This way, you don’t compromise on getting to other attractions besides Disneyland. A city hotel, it is comfortable and stylish. The rooms feature frosted glass accents and a modern, contemporary style. Free Wi-Fi is provided, and each guestroom comes with a handy smartphone that guests can use. However, some previous guests have said that the toilets can feel a bit cramped, and the gym is not so well-reviewed. Aside from that though, the Dorsett Mongkok is a good place for an urban getaway in the heart of Hong Kong. Situated in the Tsim Sha Tsui District, the Park Hotel Hong Kong is an upscale, contemporary hotel where you can expect a comfortable stay. Just five minutes away from the East Tsim Sha Tsui MTR Station, you can get to Hong Kong Disneyland easily. Strategically located in the heart of Hong Kong’s entertainment district, you will find no shortage of things to do in the days when you’re not at Disneyland. There are many night markets and malls nearby, as well as plenty of options for both street food and fine dining. The rooms are chic and modern, decorated in soothing ad timeless neutral colours. Rooms are spacious and modern, and full of the amenities you’ll need for a comfortable stay. The Park Hotel does not only provide a prime location in Hong Kong, but also a space to retreat from the fast city life. Free Wi-Fi is available. The Park Hotel also provides guests with a smartphone that has unlimited local and international calls, internet connectivity, and a city guide, thus simplifying your stay and making life easier. With a great location, the City Garden Hotel Hong Kong is about an hour from Disneyland via the MTR. Its five minutes away from Fortress Hill MTR. Unlike other city hotels, the City Garden Hotel Hong Kong is located in Hong Kong’s Eastern District. If you’re looking for a change of scenery from downtown Hong Kong, this is the place for you. It’s near to shopping havens like Causeway Bay, and with the reliable MTR, the rest of Hong Kong is never too far away. While you’ll never run out of food to eat in Hong Kong, the hotel’s food is well-reviewed. Wi-Fi is available for free. The rooms are well-equipped, with amenities like a TV, in-room safe, and tea and coffee making facilities. Hong Kong’s roads have no shortage of cabs. They are relatively cheap, clean, and they can be hailed from almost anywhere. They charge using a taximeter, and if you’re uncertain about the price you were charged, keep the receipt. There are online fare checkers that you can use to make sure you were charged correctly. Auberge Discovery Bay Hong Kong is a resort hotel that is one of the closest options to Disneyland (aside from the Disney hotels). Located on Lantau Island itself, it is a beautiful and luxurious hotel with ocean and mountain views. One disadvantage of staying at Discovery Bay is that it isn’t located near to any MTR stations, which makes getting around a bit of a challenge. However, it does provide complimentary shuttle services. You can take a shuttle right to Disneyland itself, or to Sunny Bay MTR Station, where you can head to Tung Chung Station for shopping or to Central to explore the rest of Hong Kong. With a family-friendly vibe and lots of activities for children, this is ideal if you’re looking for a peaceful resort-stay. The rooms offer views of the mountain or ocean, and have all the amenities you need for a comfortable stay. Free Wi-Fi is provided, and the hotel even has a pillow menu! Aside from shopping at Citygate Outlets, Ngong Ping 360 and Disneyland, Auberge Discovery Bay also gives you more chances to experience what Lantau Island has to offer. If your family loves keeping fit together, you can try out one of Lantau’s many hiking trails that start near the hotel. Otherwise, you can take a short horse-drawn carriage ride (300 HKD / 38 USD) or lounge in the hotel’s pool. Both a location and attraction in itself, Noah’s Ark Resort might be the coolest place you’ve ever stayed at. The hotel rooms are in a building that is shaped like Noah’s Ark. Aside from that though, it features a park that has three gardens. One features life-sized statues of animals, an adventure park with an obstacle course and a space exhibit. Basically, it’s as though you are staying in another theme park. If Disneyland wasn’t enough for your kids, then let them loose here. Located near Tung Wan Beach, Noah’s Ark Resort is near various attractions such as Tsing Ma Bridge. Also found on Lantau Island, getting around from Noah’s Ark Resort can be tough, so we would recommend using a taxi to travel to Disneyland. If you want to get to Tung Chung station though, you have to take the Tsing Yi and Park Island Bus Service from the resort. The hotel offers deluxe rooms for couples. One new feature that they offer is family rooms with bunk beds that can fit between 4 and 8 people. The rooms are beautiful and well-maintained, with all the amenities you need for a comfortable stay. Located in Tsuen Wan, the Royal View Hotel is at the waterfront between the Tsing Ma and Ting Kau Beaches. It’s a family-friendly hotel that is close to Hong Kong Disneyland. You can get there in 25 minutes via taxi. You can also take the MTR from Tsuen Wan to get to Disneyland Resort Station. The hotel provides a free shuttle to Tsuen Wan MTR station and to Tsim Sha Tsui station. A wide variety of rooms are available – you can opt for a mountain view, the poolside, the beachside, or the ocean view. Located away from the hustle and bustle of the city, the environment is calm and peaceful. The beaches make for the perfect seaside escape, and the hotel has a pool and wellness centre. If you’re looking a quiet getaway with the family, then consider staying at the Royal View Hotel. Located on the Gold Coast, the Hong Kong Gold Coast Hotel provides beautiful views of the sea and the harbour. Look at the picture above and imagine waking up to that every morning! The Hong Kong Gold Coast is a reclusive place, making it a great option if you want to get away from the city. Just because it’s out of the way doesn’t mean that there isn’t anything to do though – from hiking and beautiful beaches to swimming and dining on tasty cuisine, the Gold Coast has plenty to offer. It’s advised to take a taxi or Uber to Disneyland. Because of how out of the way it is, a trip to Disneyland via public transport would involve the bus and multiple train changes, which could be a bit tough with children. Something unique that the Hong Kong Gold Coast Hotel offers are themed rooms; your child can sleep in a rocket while you wake up to murals of outer space on the walls. Other themed rooms include a princess theme, a Hong Kong tram theme, and a dinosaur theme. Disney’s Hollywood Hotel is conveniently located next to the park. To get there, all you have to do is take the hotel’s complimentary shuttle service. After taking the shuttle to Disneyland, you can also head to the Disneyland Resort MTR station, and access the rest of Hong Kong from there. 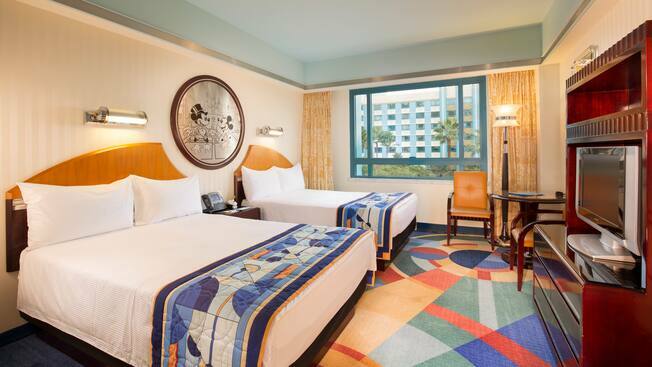 As you might imagine from a Disney Hotel, it’s a great option for kids and families. The hotel pays tribute to the golden age of Hollywood, so the interior is decked out in all the glitz and glamour of that era. Since it’s a Disney Hotel, you get to enjoy perks like dining with Mickey at the hotel’s international buffet. The hotel overlooks Discovery Bay. Guests have said that they appreciate the décor, as well as the cleanliness of the hotel and its facilities. The rooms are casual and modern with a fun vibe. With accents of blue, green, and red, the room feels welcoming and cozy. Some might find the bathrooms a bit small though. Hong Kong’s Disneyland Hotel is even closer to the park than the Hollywood Hotel. You can opt to take a ten-minute walk there, or take the shuttle instead. Do note that sometimes the shuttle is packed, so you might have to wait a little while. The hotel follows a grand Victorian theme, which is evident from the exterior to the rooms that you’ll be staying in. The grounds are beautiful and lush, with gardens and mazes for kids to run about in and two pools to choose from. The rooms are overflowing with elegance and charm, with warm colours and fancy drapes. You can also choose to purchase room decoration packages to surprise your kids – they come with gifts, bed runners, and door and window stickers. Themes include a Happily Ever After Set and a Frozen theme. Although on-site dining is pricey, at the Enchanted Garden Restaurant, Mickey and Friends will stop by to dine with you for a bit. Staying at the Disney Hotels is definitely pricier than other places, but if you can afford it, then a complete vacation in the Magic Kingdom is worth the splurge. Ready to head to the Magic Kingdom? With Hong Kong’s efficient public transport system, you’ll be able to get around easily. With that out of the way, you can now consider what else you’re looking for in your stay … a bustling urban getaway, or something a little more peaceful and quiet? From there, you can narrow down the hotels and pick one that best suits your needs. With your hotel figured out, you should be well on your way to having a fantastic holiday. All you’ll need after that is a little faith, trust and pixie dust. Have fun at Disneyland in Hong Kong!